Jason Kenney and the United Conservative Party of Alberta won a decisive victory in the 30th Alberta general election last night. A detailled post-mortem of the election will be available soon - obviously, we first need to wait for the final results, including all the advance votes that were cast prior to election day. 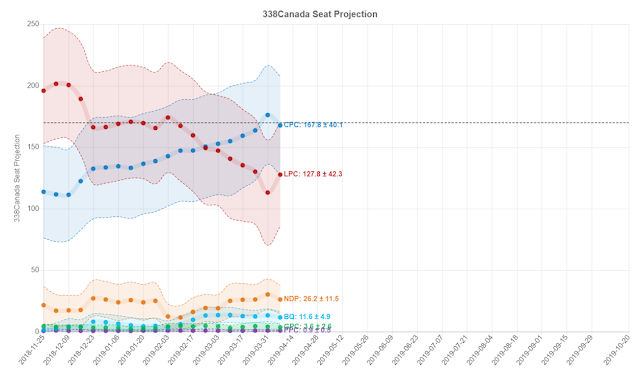 Overall it looks as though the UCP has been underestimated by pollsters, even though the polling average will fall within the final projection's confidence intervals. Some polls were off, some polls were close. That's why the weighted polling average is usually a safe bet. 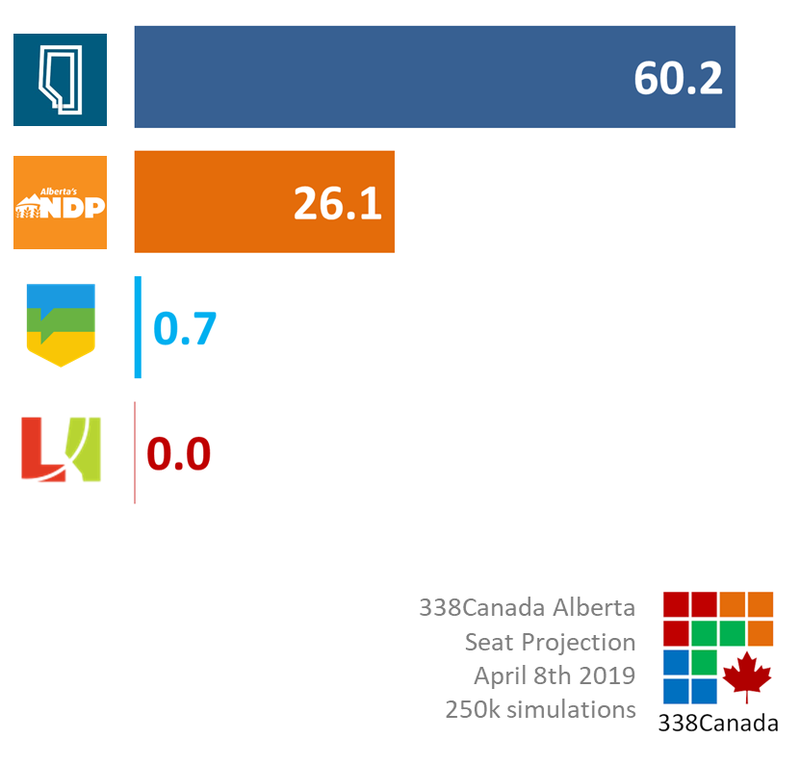 Consequently, many riding projections also underestimated the UCP, although, as you will see below, the overall record is highly satisfactory. Out of 87 districts, the 338 electoral model correctly identified the winner in 82 of them. Out of the other 5 districts, the winner was within the confidence intervals in three of them. Those are Calgary-Curie, Calgary-Elbow and Edmonton-South. Only two districts were complete misses. Those are Calgary-McCall and Calgary-Mountain-View (where the Liberal vote completely collapsed and pushed the NDP in first place). So the winner was correctly called or was within the confidence intervals in 85 of 87 districts (97.7%). More number crunching soon. I'll wait for the full results. In the meantime, I'll take a few much needed naps. 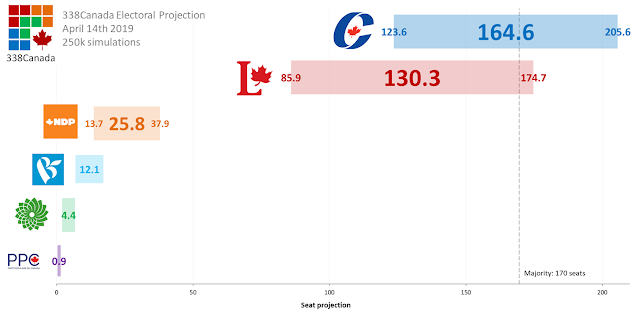 This is the final 338 Alberta Projection. But I have learned so much. I am a Montrealer who has been to Alberta exactly five times in my life. I have visited Calgary, Edmonton, Banff, Jasper and Lake Louise. And I have stopped for gas in Red Deer. That's not much, some would say. I know. But what struck me most about the Albertans I met was how nice and friendly they were. It makes me want to go back once more. I am pretty sure I will. Soon. I loved their local beer. And the landscape, my god, the landscape. Here are the final 338 numbers for Alberta. 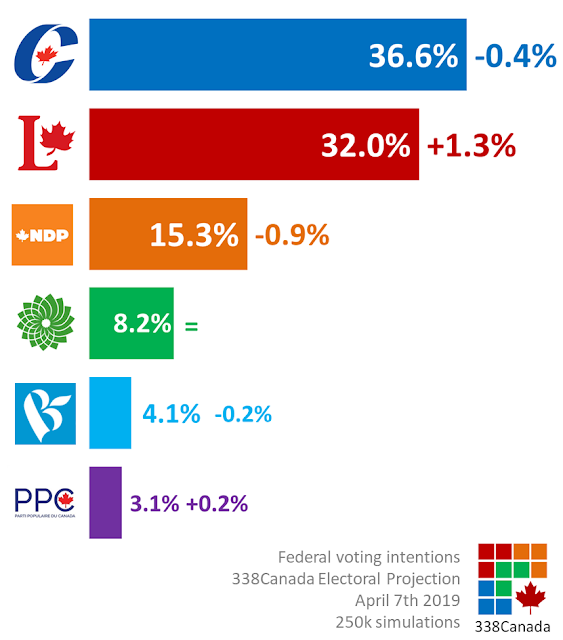 The United Conservative Party is on track to win the popular vote by 8 to 12 point margin. 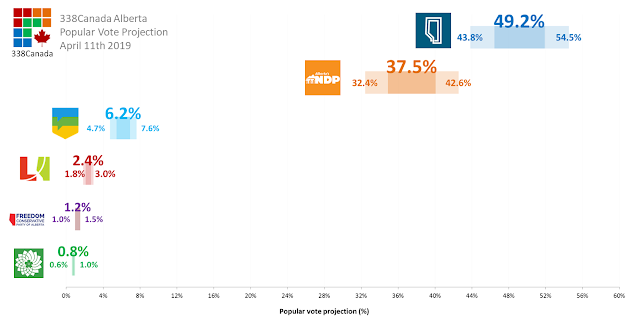 In the last polls published this afternoon, the gap between the UCP and the NDP has ranged from 6 points (Pollara) to 14 points (Léger). 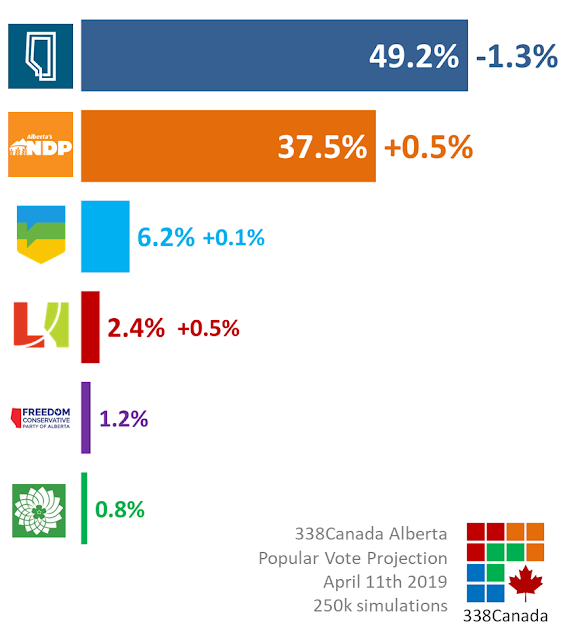 The weighted average for the UCP stands at 48.9%, a drop of two points since the start of the campaign. 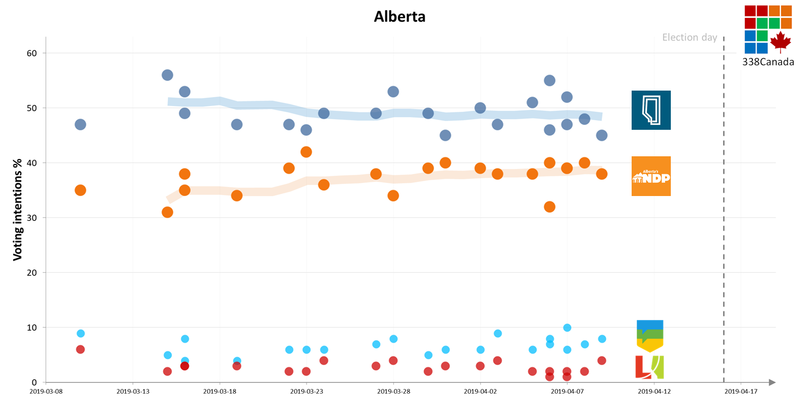 Rachel's Notley's NDP ends this feisty campaign on a positive note, with an average of 38.5%, which is 6 points higher than when the writ was drawn up a month ago. 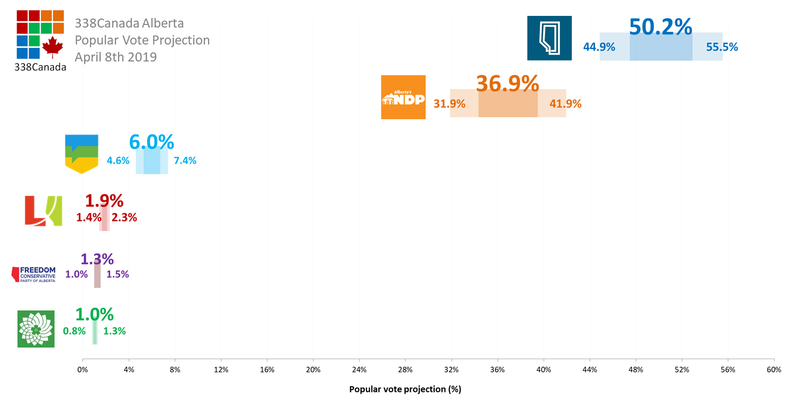 If those numbers end up accurate, the NDP will suffer a somewhat "honorable loss" by capturing a share of the vote very close to its 2015 result. The Alberta Party stands at an average of 7.2%. The United Conservative Party is on track to win a majority government. By breaking down the numbers per region and per riding, the UCP averages 60.2 seats per simulation performed by the 338 electoral model. 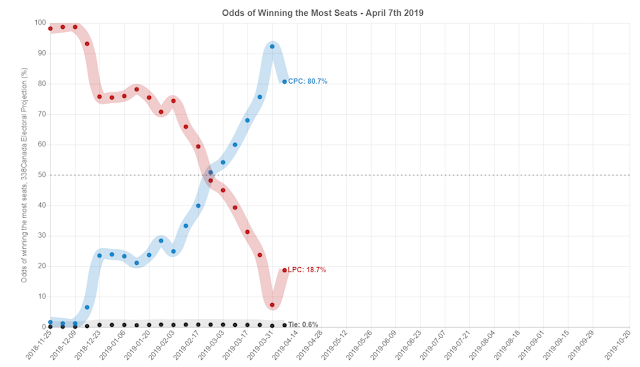 This seat average still puts the UCP well above the majority threshold of 44 seats at the LAA. With these numbers, the UCP wins the most seats in about twenty-four of of twenty-five simulations (96.2%). The NDP wins the most seats in only 3.2% of simulations, so the UCP is still, as of this morning, considered a strong favourite to win the election. 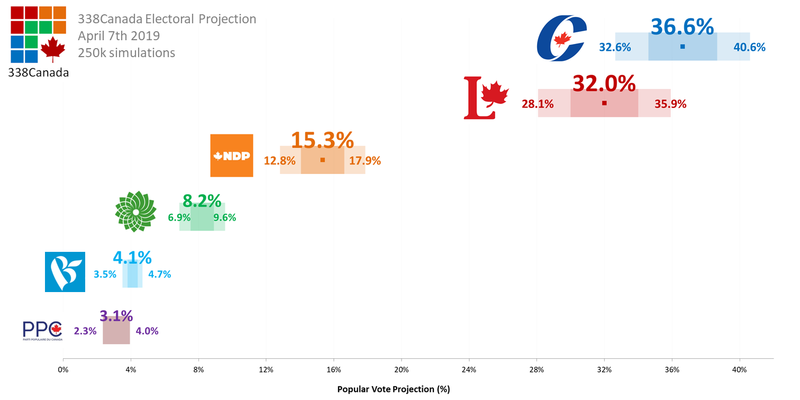 The UCP and NDP are tied for the most seats in 0.6% of simulations. Opinion polls are scientific experiments. However, unlike the cases of stars or electrons, the subjects of these experiments are human beings who have varying moods and may hold contradicting opinions. After all, humans beings are far more complex and mysterious than stars or electrons, which makes the study of their behaviour all the more uncertain. As a scientist whose career it is to teach the scientific method to young adults, I created the Qc125 and 338Canada models with the scientific method in mind. René Descartes' rules for acquiring knowledge may date back to almost four hundred years, but they still ring true today: don't judge without proper evidence, don't judge based on preconceived ideas, and don't let your judgement go beyond the evidence. While it is true that polls contain uncertainty, when conducted properly, polls also hold precious information about the mood of voters. As a rule, the 338 model sees a poll as but a tiny piece of a giant puzzle, and it is only by assembling these pieces together that we may fully understand the big picture. And the data collected and made available about Albertan voters this spring is abundantly clear: Jason Kenney will most likely become the 18th Premier of Alberta. 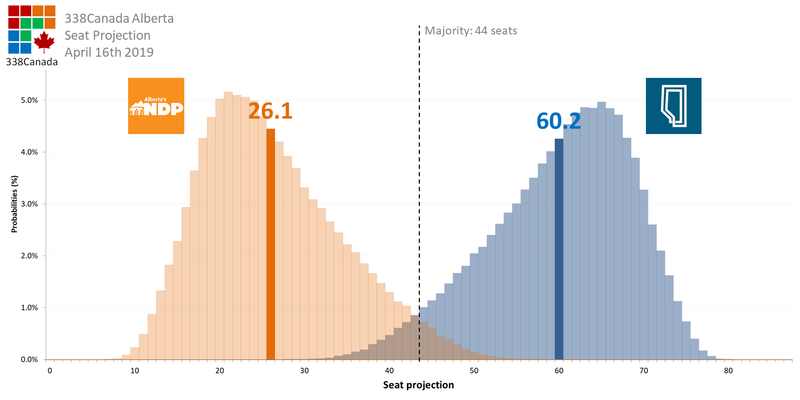 Moreover, since the likelihood of third parties winning more than one or two seats is slim, the odds of a majority government are overwhelming. Does Rachel Notley have a path to victory? The answer to that question is simple: Yes, she does, but the data would have to be wrong. The NDP would have to sweep Edmonton (which is likely), gain at least three quarters of Calgary seats (which is not), and win pockets of districts in smaller cities such as Lethbridge and Red Deer. Polling data is right more often than it is wrong the same way meteorologists, in the long run, get their forecasts right more often than not. But the Alberta polling miss of 2012 still hovers over forecasters' minds. Polls may capture the general mood of an electorate, but they do not cast votes. Only voters do. We shall see which party Albertan voters will have chosen tomorrow to lead their government for the next four years. Thanks to all readers of this page. I couldn't have done it without your support. Time to crack open a cold one. Go Flames. Boo Leafs. I hope regular readers of the blog will forgive the brevity of this post. The Alberta election comes down to the wire this week and my mind is fully on getting the Alberta projection and analysis right. Therefore I present you the main graphs of this update without analysis. For those interested, here is the 338 Alberta page. 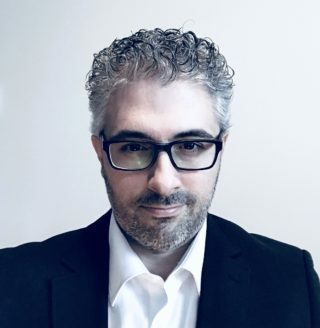 Here is the 338 Federal Update for April 14th 2019. Have a great week, and thank you for supporting this page. Polling firms only have three more days to take the pulse of Albertan voters ahead of the 30th Alberta general election next Tuesday. 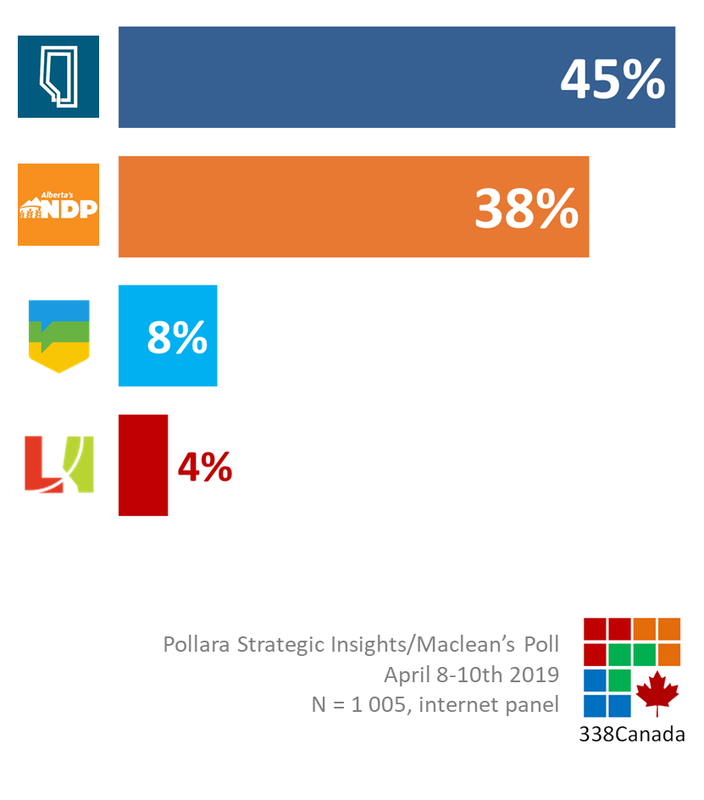 After Angus Reid earlier today, Pollara Strategic Insights published its first Alberta horserace numbers in a poll published by Maclean's magazine (see article by the excellent Jason Markusoff). 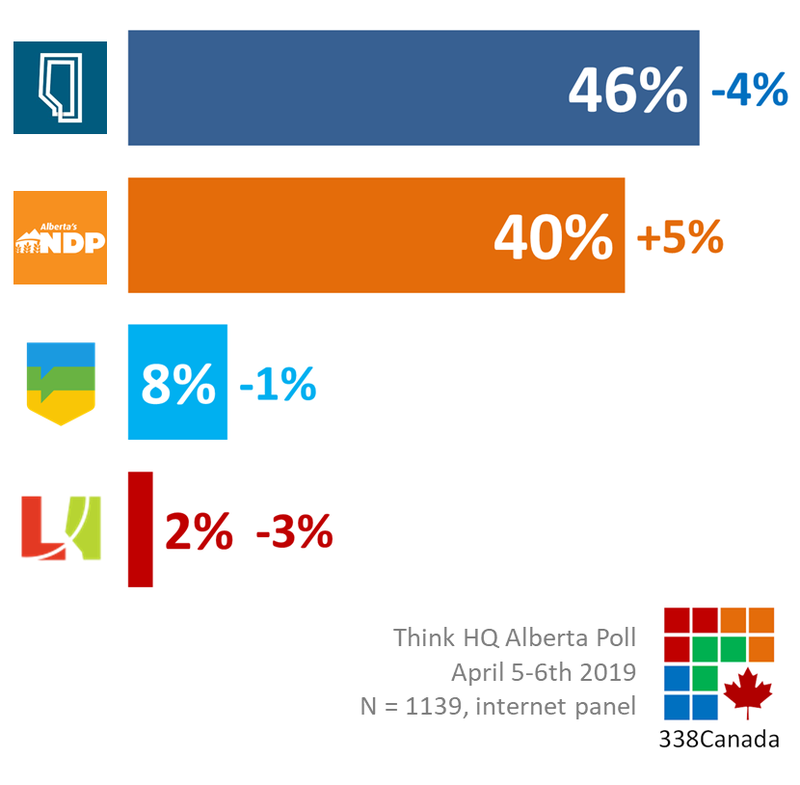 The United Conservative Party stands at 45% of leaning and decided voters, which is the lowest the UCP has polled since the campaign began (since this is Pollara's first Alberta poll, we have no baseline from comparison). The NDP's support seem to have stabilized in polls of this past week (with the notable exception of Forum Research). 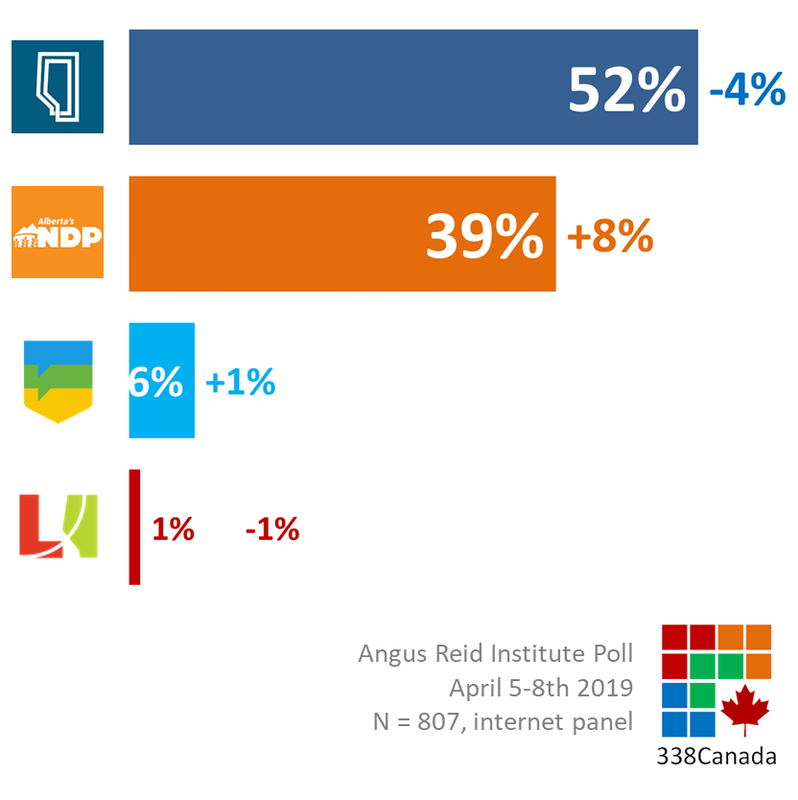 Pollara measures the NDP at 38% (earlier today, Angus Reid polled the NDP at 39%). The Alberta Party stands at 8% and the Liberals at 4%. It is interesting to note that this Pollara poll is the only one of late to include the Alberta Independence Party in its tables. The AIP is at 2%, and so is the Freedom Conservative Party. The Green Party of Alberta is at 1%. The full list of polls is available is here. The 338 Alberta model will be updated overnight. Albertans will be able to see its details in time with their morning coffee. Here is the poll report from Pollara. A new Alberta poll from the Angus Reid Institute was published this morning and its results seem to converge towards the current narrative: the UCP leads by double digits, but the NDP has closed the gap significantly since the writ was drawn up in mid-March. The United Conservative Party receives 52% support from decided voters, a drop of 4 points since March. With such support, the UCP would win a comfortable majority at the LAA next Tuesday. The NDP climbs to 39% support, an increase of 8 points since ARI was last on the field a month ago. From a 25 point deficit, the NDP has narrowed the gap to only 13 points and is polling closer and closer to its 2015 result of 41%. This poll will be added to the 338 Alberta projection in time for the next update tomorrow morning. Stay tuned. Here is the poll full report from ARI. 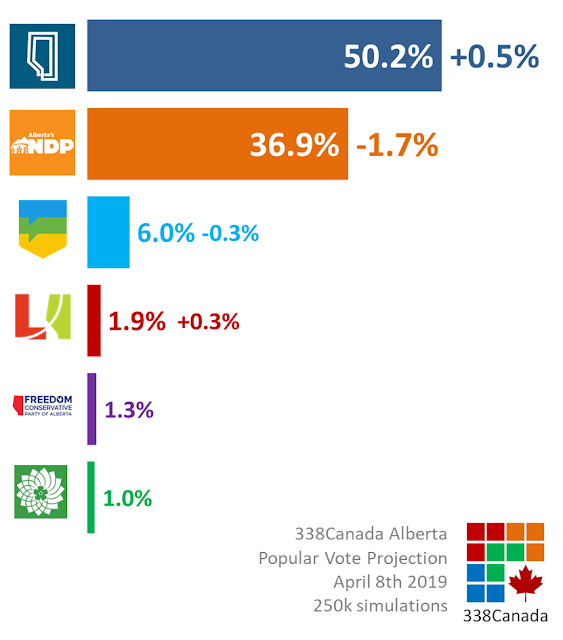 As we enter the last stretch of the Alberta election campaign, new polls from Ipsos/Global News and Think HQ show that the race between Jason Kenney's United Conservative and Nachel Notley's NDP has increasingly tightened - even though both polls project a conservative victory. 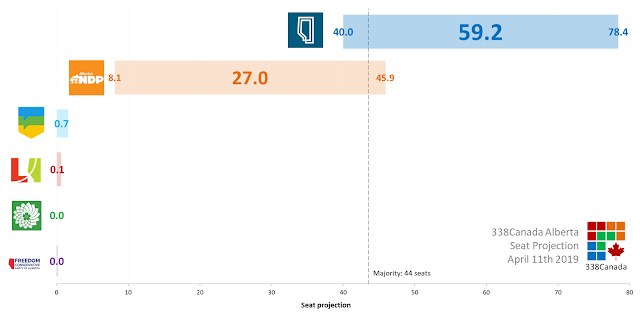 Nevertheless, those new numbers from Think HQ also show that the UCP would easily win next week's election, because of the high concentration of NDP support in Edmonton, where the NDP is measured at 54%, a crushing 23 point lead over the UCP. Outside of the Alberta capital, the UCP leads by 16 points in Calgary and by 24 points in the rest of Alberta. Secondly, Global News publishes a new Ipsos poll this morning that, although its numbers differ from Think HQ, shows similar tendencies. Ipsos was last on the field in mid-March and had the UCP ahead by 19 points over the NDP. 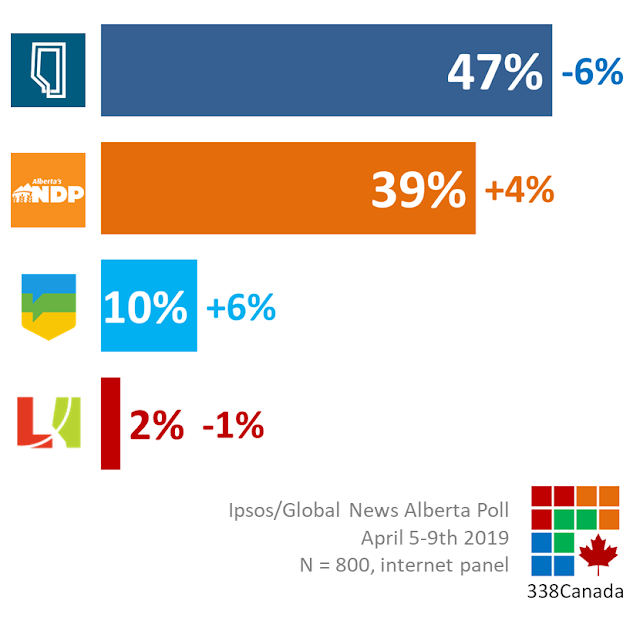 It is also worth noting that Ipsos measures a significant climb for the Alberta Party, from only 4% in March to 10% this week. That number is somewhat higher than the current AP average, but it is still hard to see the AP gaining seats next week - unless there are hyperlocal effects that cannot be detected by provincial polls. Fortunately, Mainstreet Research has announced it will publish a flurry of riding polls in the coming days for it (paywalled) daily tracker. 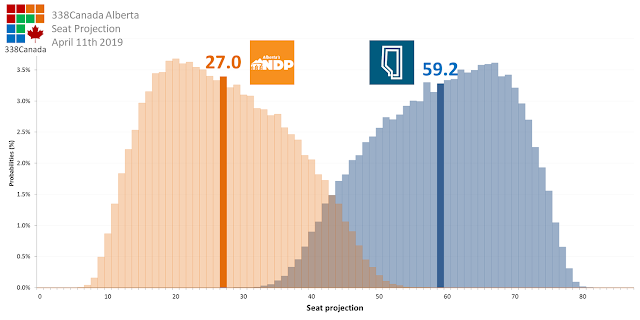 These new polls from Think HQ and Ipsos will be added to the 338 Alberta projection tomorrow morning. Stay tuned. The Tampa Bay Lightning, but you already knew that. I hope readers of this blog will allow me to write something a little lighter than politics and election projections. See, I ran the 338 Hockey projection since New Year's Day, and the results have been encouraging - the model correctly called 56% (365 of 649) of all games since. So I thought I could write an NHL playoff simulator using the same basic parameters. These odds will of course be updated on the 338 Playoffs page after every playoff game. 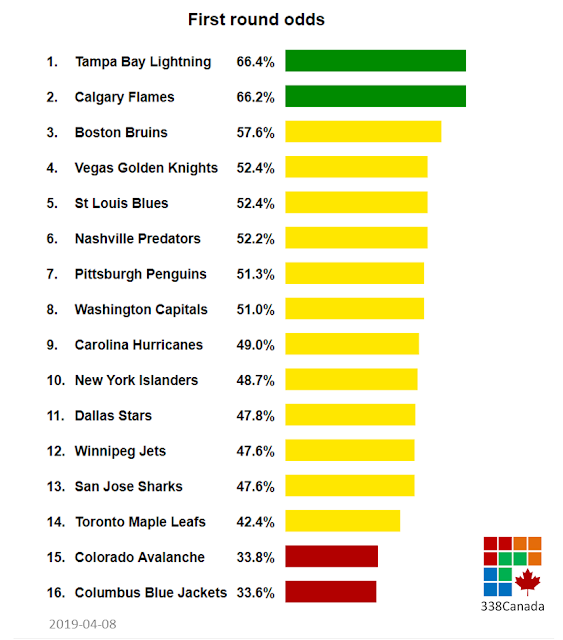 How do the Canadian teams fare according to the 338 Playoff simulator? 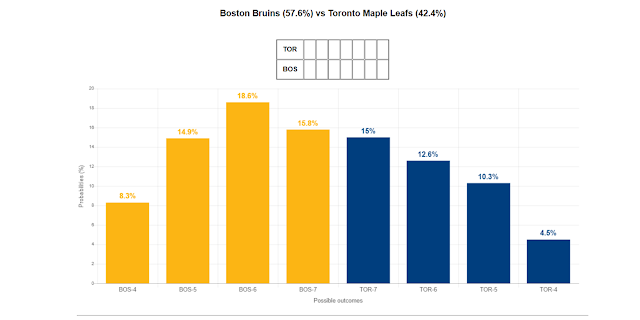 Boston wins 57.6% of all simulations. The most likely scenario is Boston in 6 (18.6%). 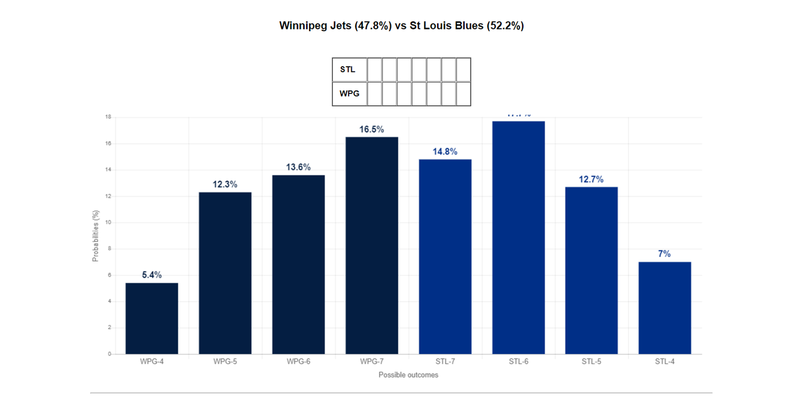 The most likely scenario is Blues in 6 (17.7%), and the second most likely outcome is Jets in 7. It should be a fun series! Finally, the Calgary Flames are heavy favourites against the Colorado Avalanche. Calgary wins 66.2% of simulations, or about two thirds. The most likely outcome of this series? 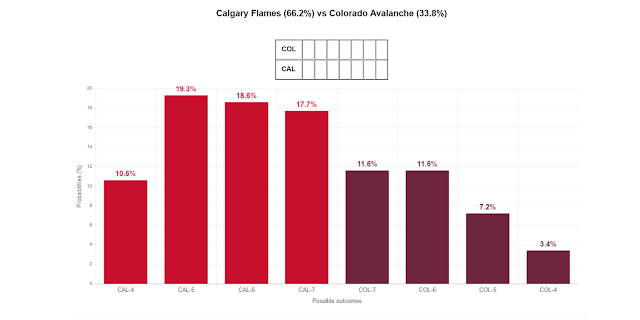 Flames in 5 (19.3%). 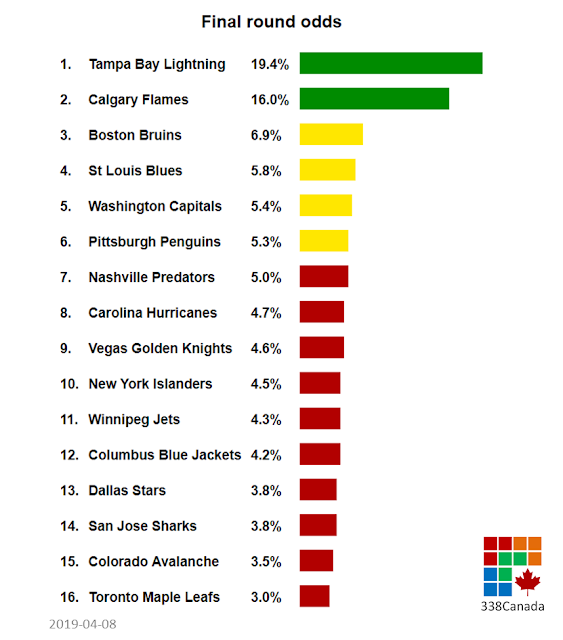 If you are shocked to see the Maple Leafs at only 3.0% odds of winning the Cup, it is not because they are a bad team, but rather because they have by far the toughest road to the final. 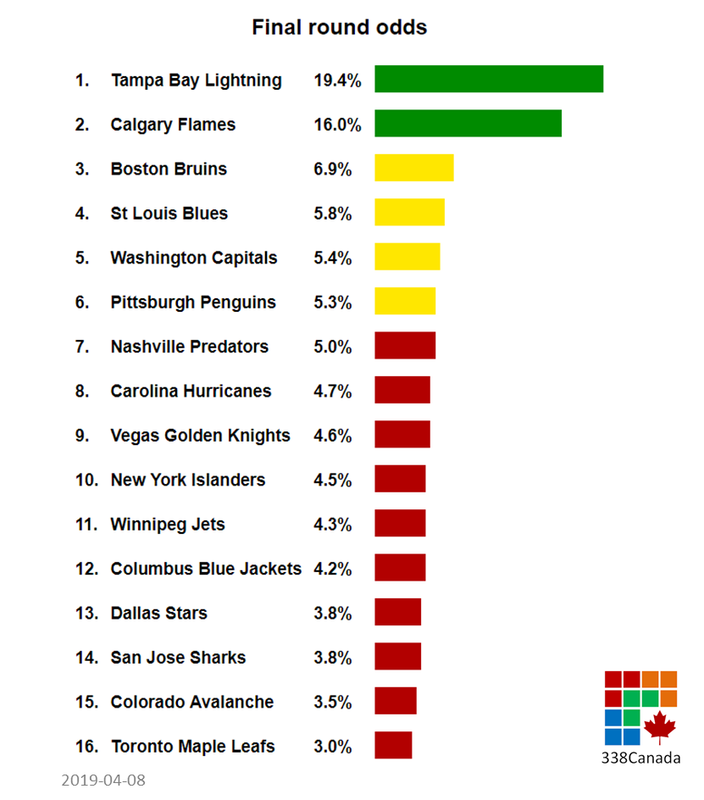 Look who are the current Cup favourites: #1 is Tampa Bay, which would most likely be the Leafs' second opponent - that is only if Toronto can beat #3 Boston in the opening round! I will update these daily once the playoffs begin. Enjoy! Ok, back to politics now. Unless Alberta voters don't show up at the voting booth nest Tuesday, it looks increasingly inevitable that the United Conservative Party will not only form the next Alberta government, but win a substantial majority at the LAA. Two new polls have been published in the last twelve hours or so. First, Forum Research does what Forum does best: publish numbers that are both somewhat believable, but still outside of the current margins. Forum measures the UCP leading by more than 20 points: 55% to 32% for the NDP. Forum has the UCP ahead in every region of Alberta - yes, including Edmonton. Second, Mainstreet Research sent out an embargoed poll for its daily tracker subscribers last night (the embargoed ended at 6am this morning, eastern time). 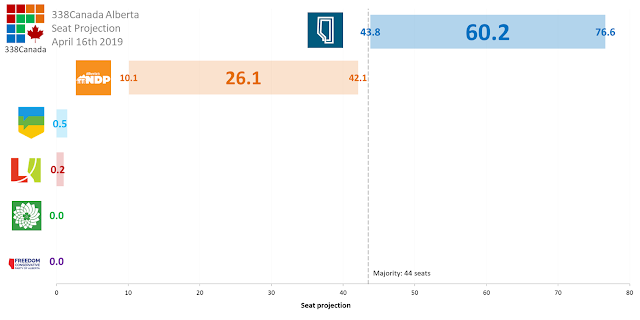 Their numbers are more inline with what we've come to expect so far: the UCP leading by ten points in Calgary, trailing by ten points in Edmonton, and ahead by a lightyear outside of the metropolitan areas. The full list of polls is available here, including links to the polls' full reports. 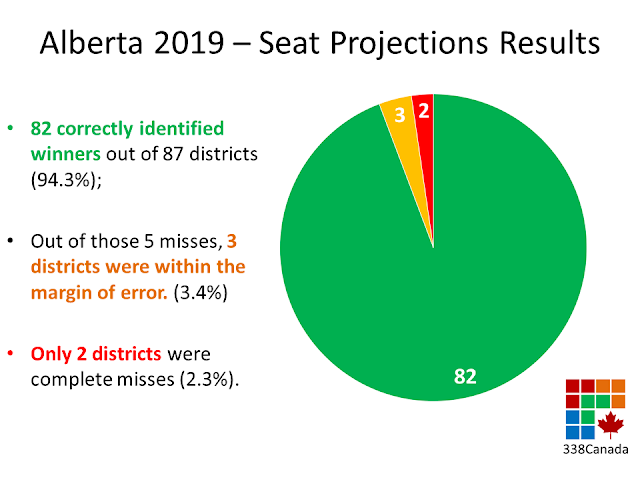 Here is the 338 Alberta Update for April 8th 2019. The United Conservative Party not only still leads the way, but widens the gap on top of voting intentions with the support of about half of Albertan voters, averaging 50.2%. (graph below compares numbers with those of last week). 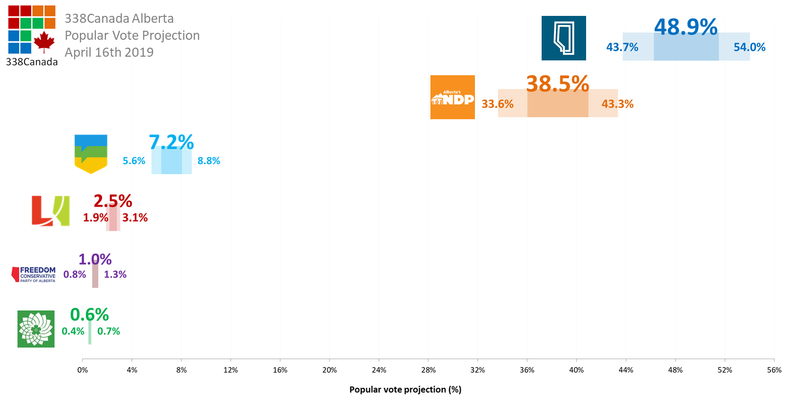 Rachel's Notley's NDP stands at an average of 36.9%. 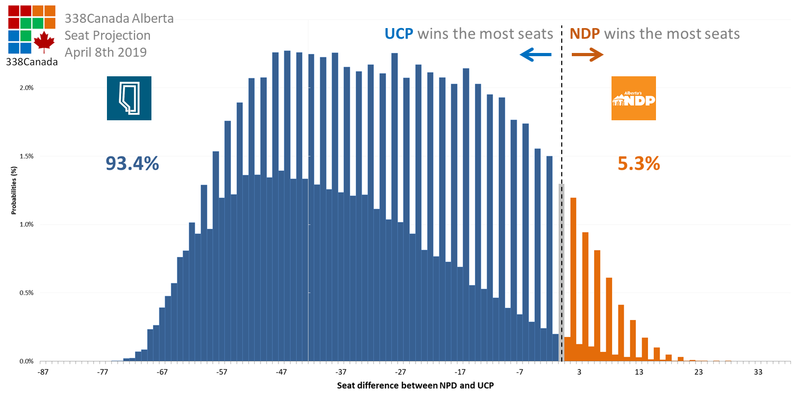 The NDP leads in Edmonton, trails the all important battlefield of Calgary, and is behind the UCP by more than thirty points outside of the two urban areas (here are the links for Northern Alberta and Southern Alberta). Apparently, the leaders' debate has not changed the momentum of this race - at least according to both polls that were conducted after last Thursday's feisty affair. Neither the Alberta Liberal Party's nor the Alberta Party's campaigns seem to have moved the needle so far. Voting intentions have remained incrdibly flat, which, I must say, I find surprising. The United Conservative Party is still leading the NDP as of this morning, averaging 60.2 seats per simulation performed by the 338 electoral model. This seat average puts the UCP comfortably in majority territory (threshold for a majority is 44 seats). 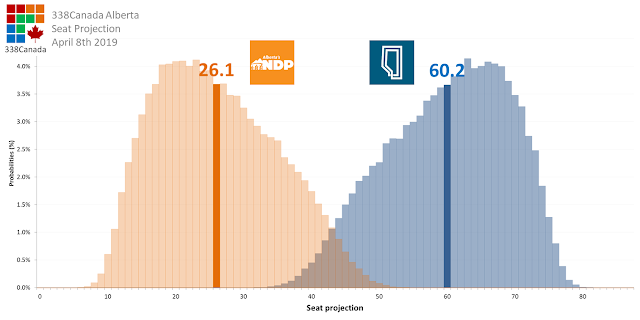 The NDP's seat average goes down to 26.1. The NDP still appear to have a low ceiling of seats since it is polling so poorly outside of Calgary and Edmonton. 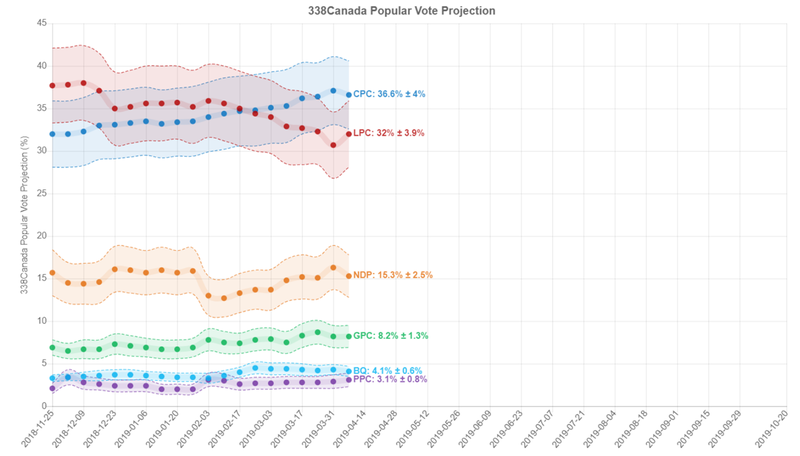 Even with a major polling error - from every polling firm on the field so far - the 338 model calculates that the NDP's superior confidence interval barely reaches 40 seats. 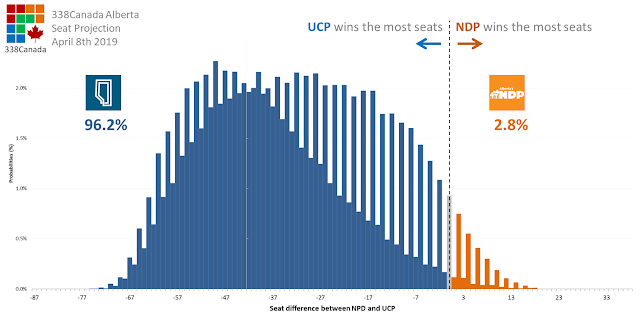 With these numbers, the UCP wins the most seats in more than nineteen of twenty simulations (96.2%). 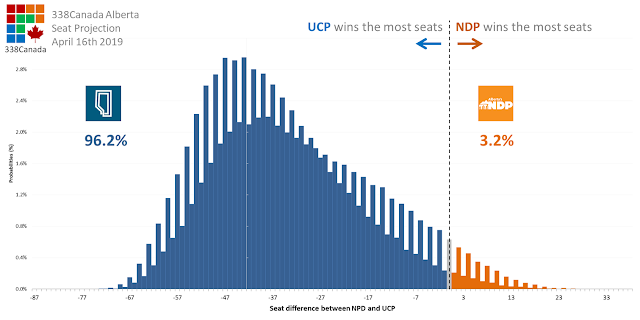 The NDP wins the most seats in only 2.8% of simulations, so the UCP is still considered a strong favourite at this point. The UCP and NDP are tied for the most seats in 1.0% of simulations. 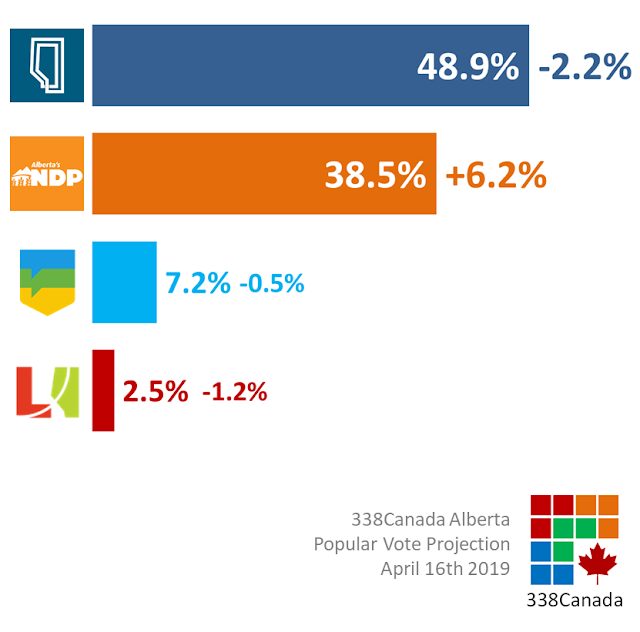 Looking at these numbers, these is little doubt that Jason Kenney most important obstacle until election day will be voter apathy (and complacency?). Polls may measure the mood of public opinion, but polls do not vote. If UCP supporters stay home on election day, they could be in for a bad surprise later that night. Will the SNC-Lavallin story/saga/scandal - depending on one's perspective - finally come to an end for the Liberals? 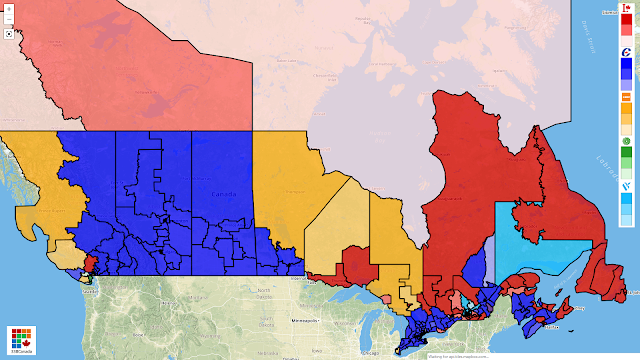 Whatever one's opinion on the matter, and there sure has been a wide spectrum of takes that have been said and written by now, one simple fact we can take from the last two months is this: it hurt Justin Trudeau in the polls in every region of Canada - yes, even Quebec. That being said, Conservatives have not exactly been able to distance themselves as much as they surely would have wanted. Polls of the last few weeks have ranged from a nine to ten point CPC lead (Ipsos, Angus Reid) to a statistical tie (Mainstreet, Nanos). And the general election is still 197 days away. Here is the 338 Federal Projection Update for April 7th 2019. 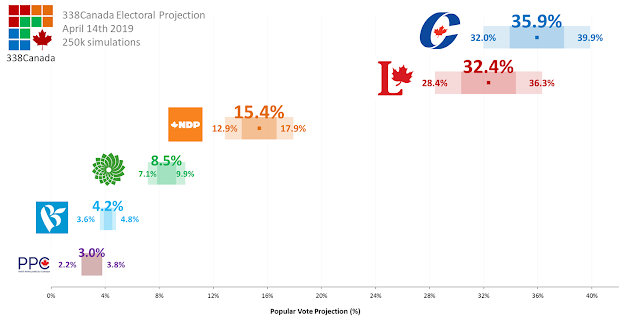 The Conservative Party of Canada is leading the popular vote projection again this week with an average support of 36.6%. The national figures of both new polls were within less than a point from last week's average, so the CPC projection remains stable this week. The Liberal Party of Canada, after eight consecutive weeks of losing support, seems to have stopped the bleeding and stands at 32.0%. No polls whose field date came after the firing of Jody Wilson-Raybould and Jane Philpott have yet been published, so next week's numbers should be interesting. Have Canadian voters tuned this story out or has that cloud not been lifted on the LPC just yet? We'll know soon enough. The New Democratic Party's average stands at 15.3% nationally. Unfortunately for Jagmeet Singh, his by-election win appears to not have boosted his party's voting intentions. Of course, he himself cannot be blamed for getting elected in the middle of the worst crisis of Justin Trudeau's reign so far. The Liberal Party of Canada climbs modestly this week to an average of 128 seats. It is worth noting that around 110 of those 128 seats are located east of the Manitoba-Ontario border. See all 338 district projections here. 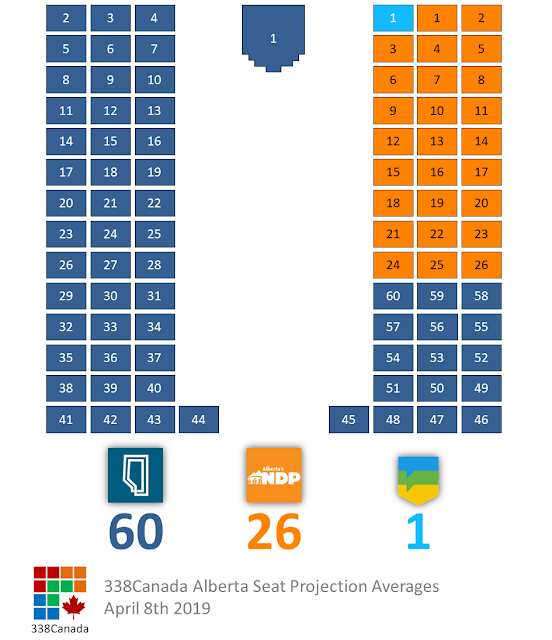 The NDP wins an average of 26 seats per simulation, still far from its 2015 total of 44 seats. 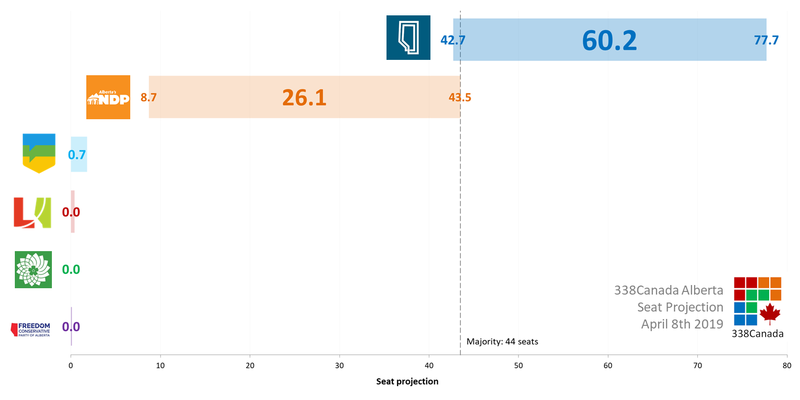 The Bloc québécois holds steady at an average of 12 seats, the Green Party 3 (all on Vancouver Island) and PPC, 1 (Beauce). 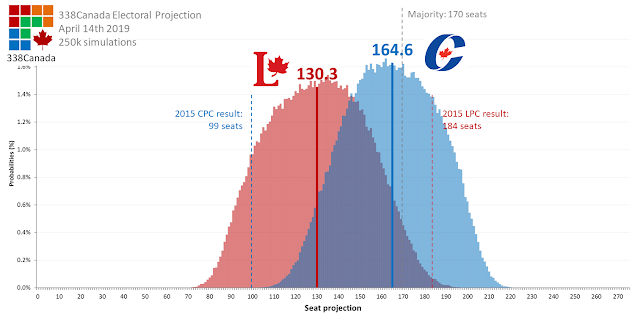 The 338Canada model performed 250k general election simulations using the electoral history of districts, the demographic profile of voters per district and opinion polls published in the last weeks (the polls are all listed on this page). 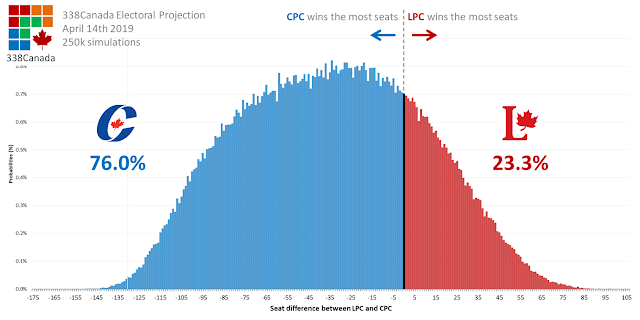 After tallying the results, the Conservative Party of Canada wins the most seats in 80.7% of all simulations, or about four in five simulations. Moreover, the CPC wins over 170 seats in 47.7% of simulations. 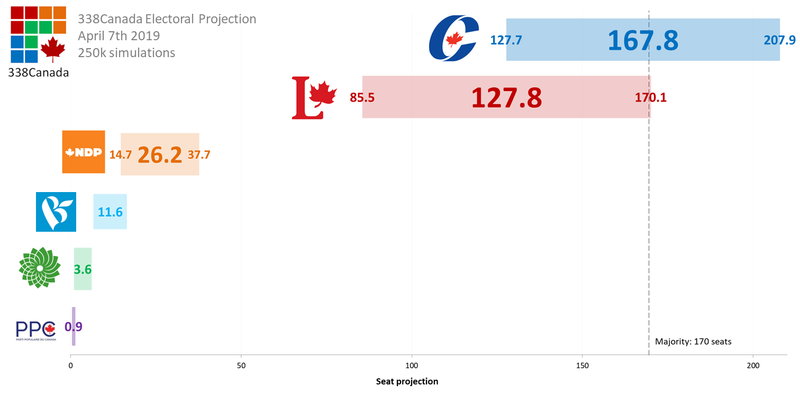 The Liberal Party of Canada win the most seats in 18.7% of simulations. 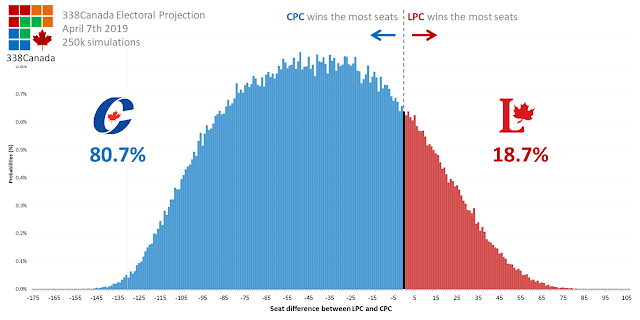 There is a tie between the LPC and the CPC in 0,6% of simulations. As usual the 338 Federal Projection will be updated next Sunday. In the meantime, I invite you to check out the 338 Alberta page. The 30th Alberta general election will be held on April 16th... less than ten days away!